One of the best things about Summer is growing, picking & eating soft fruit. We have to wait through all the dark, dreary Winter months here in the United Kingdom until the Summer comes around and we can feast on berries again. 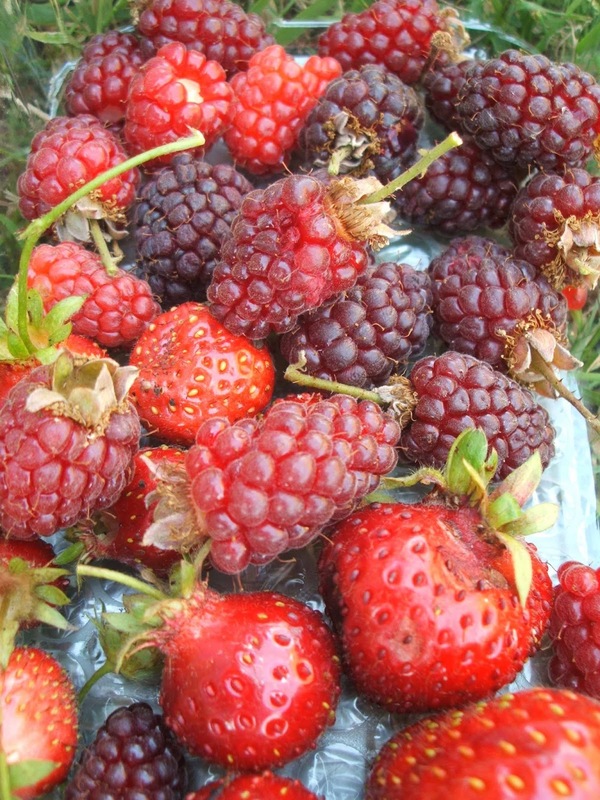 On our allotment this year we have found the strawberries a bit disappointing, but the tayberries were a big success. We manage to pick quite a few each time we visit, but they never seem to make it home...funny that. My argument is that soft fruit does not travel well, so we prefer to find a spot by the shed and eat our bounty there & then. 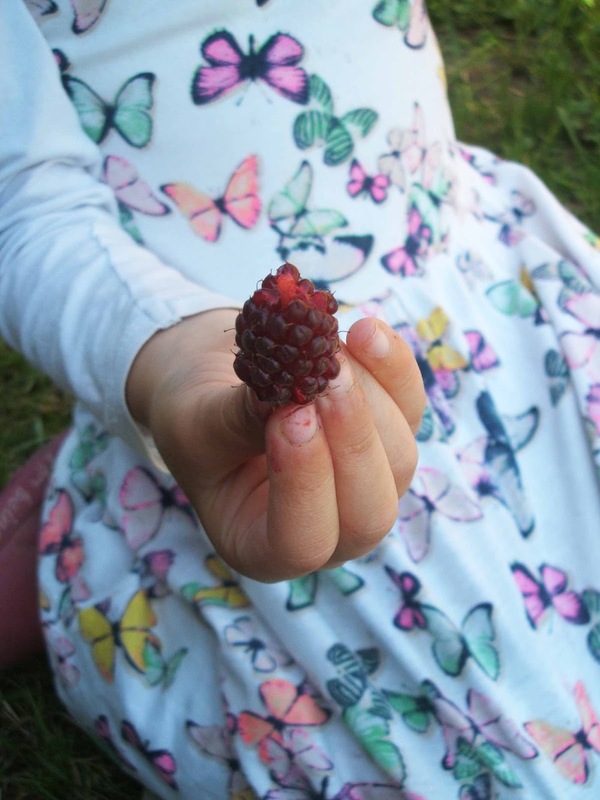 If Magoo goes home with berry juice on her dress and fingertips, then it has been a good day at the allotment. 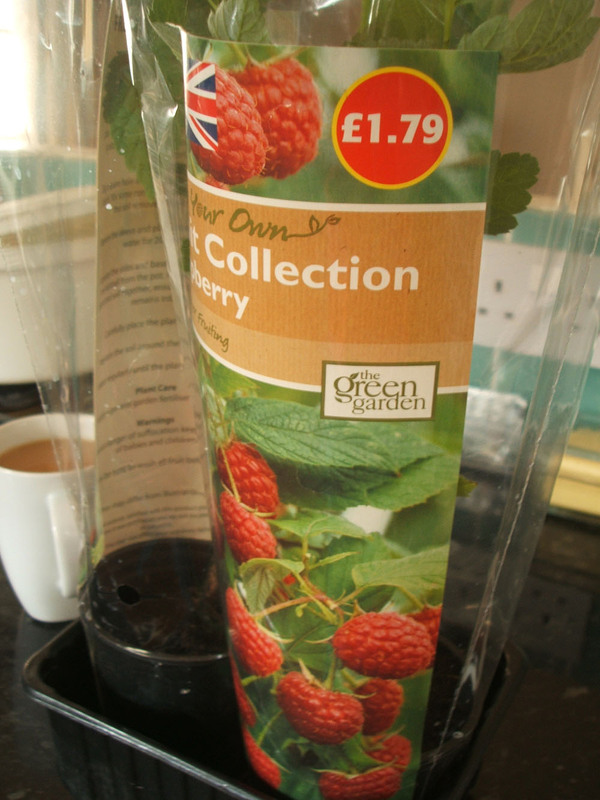 I have just bought two new raspberry plants for the bargain price of £1.79 from good old Aldi. The raspberries we inherited from the previous owner have been swamped by blackberries. So a few days ago my Mum & I attacked the blackberries with secateurs. We already have a large blackberry hedge at the top of the allotment, so we're happy to lose some to make make room for raspberries. Your berries look so juicy and delicious :) I like that you eat your freshly picked by the shed - I quite often scoff a few blueberries straight from the bush. Oh I love a good tayberry. When I stayed with Rosie who joins in with HDYGG I tried some of her tayberry salad dressing and smuggled home a jar of tayberry jam *shhh* Until then I had never eaten one knowingly, though in hindsight maybe lots of the raspberries I've eaten have been tayberries... It's so satisfying picking fruit you have grow isn't it? The Tayberries came from Aldi too...they are about three years old now & this has been the best year yet. We definitely had fruit in second year & once they get going, they fruit really well. I think fruit bushes & trees are a long-term commitment! Tayberry salad dressing sounds amazing, will have to have a go at making that next year. I love growing fruit, except for strawberries which at home and at our plot get completely munched. We have red and green gooseberries, blackberry, raspberry (a whole row inherited) tayberry and red currants. Some of those were from Aldi/other cheapy shops and they have done so well. We have been well supplied in berries all summer. Those berries all look delicious, I'm not surprised they don't make it home. The best treat on the way home from picking berries are the berries you have just picked. I'm sure all the hard work with the Blackberries will be worth it and you'll have a nice crop of Raspberries for next year. Thanks for linking up with me on Country Kids. Good hear others have had success with Aldi fruit plants. I often buy plants from there & haven't been disappointed so far. Just back from a weeks camping, so going to allotment later to see if raspberry plants are still alive! Well done you, they look delicious!